Friday night. Forty seven year old single mom sitting at the bar drinking wheat beer. You’re thinking it’s about time I blogged again, right? I used to wake up with fully formed ideas in mind. Middle of the night – you name it. I’d jump up and run to my computer to blog my latest gem of observation about my life. Lately, not so much. But here I am. Sad woman alone in a pub, drinking and blogging on my iPhone. And the battery is dying. Has to be a metaphor for something. Lawrence is waiting for me at home. It’s my turn to be out in the middle of the night, making people wonder- making me wonder. But it’s okay. Lawrence needs to talk. He’s at home, boozeless. He’ll have to wait for my blueberry ale and truffle fries. What then? We talk. It’s been a year of pain and mental illness for me. And Lawrence has stood by me. But the cracks in our world are bleeding and we’re fresh out of Carmex. No matter. I hear it’s addictive. 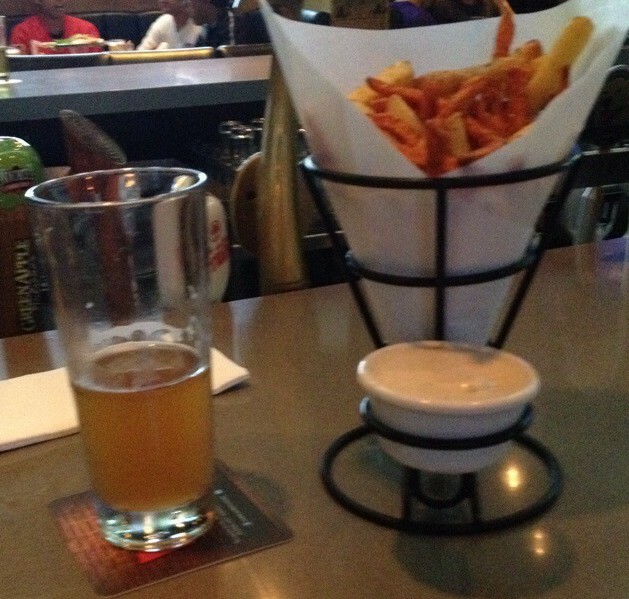 Truffle fries are ok. Beer is refreshing. No one is bothering me here. That’s good and a teeny bit of a bummer. But that’s just my ego talking. Cougar blogging! Stand back!! How did this happen? I started out today happy! Oh! There is so much to tell you since my last post!! I work now. Part time. And I leave work feeling joyful. If you follow me on Twitter, you may have figured out – I am a fundraiser. It truly rocks. I left work tonight feeling amazing. And I drove across the city to pick up Lawrence from his comedy show (he hosted!!). I was excited. I met Lawrence at the club and he sucked the life out of me. Like a punch in the gut. A pin in my balloon. A veritable downpour on my parade. How do people get here? I don’t understand. This is familiar ground and I’m preparing myself for anything. Everything irritates him. What a weird situation. Irritation. But that’s MY gig! Dude! You’re not supposed to power out on me! I’m the power-outer!!!! I’m the under-achieving, over-expecting chronic beginning with no end exhausted from the changing Phoenix perpetually trying to rise who messes this stuff up!!! I don’t know this game! This path. This… What is this even? Scenario. 10% left on my battery.